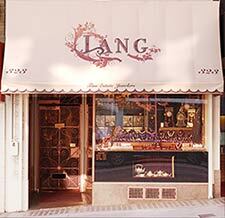 Lang Antique Jewelry is more than a store full of beautiful jewelry. At Lang Antique Jewelry we pride ourselvs on being a family with a passion for antique and estate jewelry, history, decorative arts and fine silver. 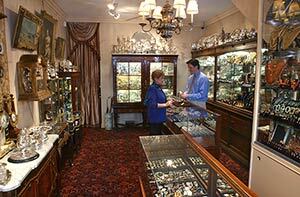 We enjoy our relationships with our customers and we try hard to match them with our unique jewelry and objet d’art. Our collection has been carefully curated and every piece of jewelry we sell has been carefully examined, the stones identified and graded, historically researched and evaluated, lovingly restored (if need be), photographed, and verbally described. We carry over 7,000 unique and individual jewelry items in our store. Our family includes gemologists, historians, jewelers, photographers, stylists, sales people, artists, appraisers, and curators. We have been buying and selling fine antique jewelry and fine estate jewelry since 1969.
by: Andrew I just wanted to let you know that I surprised my fiance last night with the gorgeous Art Deco diamond engagement ring. When she opened the box she almost fainted at the dinner table. It caused such a scene that half of the restaurant diners came over to ooh and aah. Thank you so much for your wonderful and attentive hand holding during this most important purchase. I feel like I made a friend in the jewelry business.